In October, I asked Ethan what kind of birthday party he'd like this year. "A digger party with a bulldozer cake" was his quick reply. I wasn't surprised, the kid can't stop talking about diggers, graders, back-hoes, bulldozers, and cranes, it only made sense that he'd want them incorporated in his third birthday celebration. Everything was DIY'd: cake, decorations, favors, "helmets", even the huge wrecking crane that was the favorite activity of the party. I went so far as to talk a local construction company doing work nearby to drive one of their Bobcats over for a makeshift photo booth. The kids thought it was amazing. Construction! We don't drive anywhere without seeing a digger or bulldozer or crane, so inspiration is everywhere. I love having an activity at our parties, something to entertain the kids besides cake and presents. The wrecking crane was a huge hit! We've got pretty eclectic taste, but I try to create a theme and stick with it. Colors, fonts, imagery...everything works together. I try to use things I have laying around as much as possible when planning a party—like the door wreath? That's been made over about 10 times for different parties and showers. I use my Silhouette cutting machine to make everything it can handle, especially buntings. I like things to stay simple, not cluttered, but always want enough so it REALLY feels like a party. Balloons are a MUST for kids parties. The biggest undertaking was the wrecking crane...yet it cost me almost nothing. I grabbed a giant roll of yellow paper (from Hobby Lobby or Michael's), some leftover black paint, a few hand weights, and a whole lotta tape later, we had the makings of a crane. My dad helped to fashion a wrecking ball using a random chain, a molly bolt, a ball of newspaper and that was it. We helped the kids stack towers of cardboard blocks that came safely crashing down when the ball hit. The cake was another challenge...while I love to bake, I'm not a cake decorator. But using mini-construction vehicles (found at the Dollar Store), some candy rocks (from Hobby Lobby), cone candles (from amazon.com), and pre-made fondant (from Party City), it somehow came together. I carved a "road" out of the cake layers and traced around cut-out letters in my chosen font to get the fondant letters to look just perfect. A Hammering Station was another party feature. I bought floral foam from the Dollar Store and let the kids "nail" in golf tees using the various toy hammers we had on hand. A couple pairs of pliers came in handy too. One of my favorite details had to be the construction helmets. I cut little squares out of foam sheets, then attached each child's initial (again, cut out of foam) onto the square. With a little duct tape I secured the squares to the plastic helmets and handed them out to each party guest when they arrived. Seeing the kids running around in their helmets really made the party feel like a real construction site. The helmets. 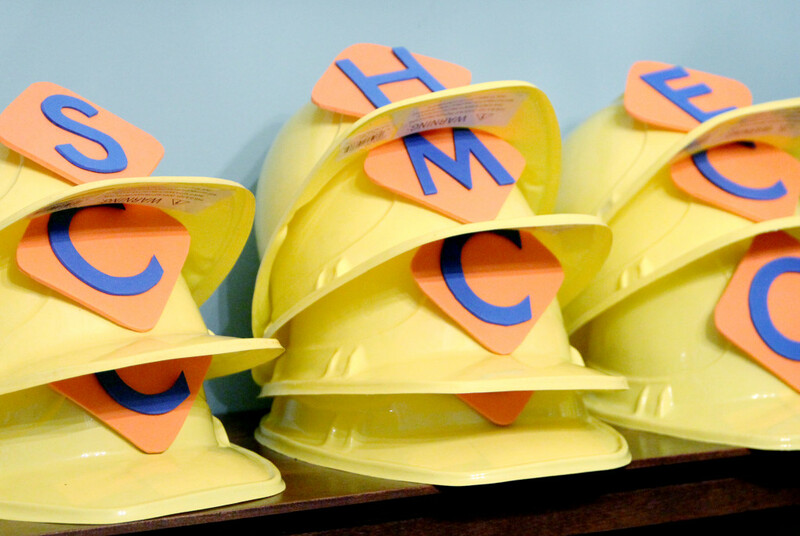 Seeing the kids running around in their personalized yellow helmets made our house feel like a real construction site! I also loved watching the party goer's faces light up as they climbed aboard the borrowed Bobcat parked in front of our house. It made for the perfect photo booth, even if it was freezing outside! Don't worry about DIY'd things not looking "perfect". When you make something yourself, it's ok if it LOOKS a little homemade, that's the fun part! Don't be afraid of a little imperfection...just go for it! A perfect example is our wrecking crane. It had a couple paint drips (tip: don't use oil based paint!) and extra tape all over, but once it was in the party room surrounded by kids, it looked amazing. And the kids LOVED it.